Before May, the only commonality between Mookie Betts' (pictured left) and Anthony Ranaudo's careers was their professional debuts in 2011. But after completely dominating their respective competition in Greenville and Portland during the second month of the season, Betts and Ranaudo share another career attribute as they've earned SoxProspects.com Player and Pitcher of the Month for May, respectively. Betts takes home the honors for the first time in his career, while Ranaudo garners the monthly accolade for a second consecutive month. Betts, who was voted SoxProspects Player of the Week for the week of May 13, burst onto the scene in May, and that may be an understatement. After batting .157/.333/.286 in April, the second baseman exploded to a May slash line of .356/.472/.663 while quadrupling his home run total from two to eight and seeing his double count increase from one to 14. The 20-year-old earned a base hit in 23 of 26 contests and had a 19-game hitting streak during the month, which was snapped on May 26. 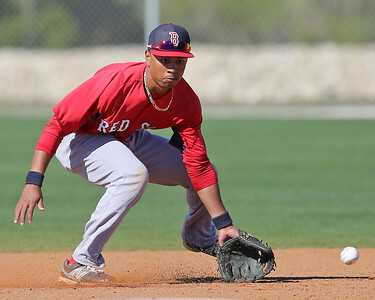 Currently riding a 27-game on-base streak, Betts jumped 28 spots in the SoxProspects' rankings due to his recent success. He had no home runs and just eight doubles in 255 at-bats coming into this season, so it'll be interesting to see if this current power exhibition is somewhat sustainable. 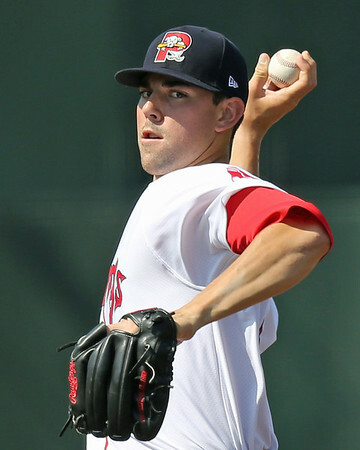 Ranaudo (pictured right), 23, continued his career revival last month with a 1.91 ERA and 32-to-10 strikeout to walk ratio in 33 innings pitched for the Sea Dogs while essentially topping the system in every category during the month (min. 25 IP). Ranaudo's 32 strikeouts was third best in the system during May, behind only Matt Barnes and Brandon Workman. He led the system in WHIP (0.91), opposing batting average (.168) and opposing OPS (.522), each by a good amount over the second-place pitcher. Ranaudo's health and fastball command has allowed him to undergo a turnaround from his 2012 campaign, one that Portland manager Kevin Boles claims was a mulligan. He seems near-ready to make the jump to Triple-A, which could come sooner rather than later at this pace.